Happy, healthy parents help to make happy, healthy children. Mobilize and empower the community to reduce substance abuse primarily among youth through action, education, and collaboration. The Tri-Town Substance Abuse Prevention Coalition envisions the communities of Chester, Deep River, and Essex CT as safe, healthy and free of substance abuse. Reduce substance use among youth and, over time, among adults by addressing the factors in a community that increase the risk of substance abuse and promoting the factors that minimize the risks of substance abuse. Establish and strengthen collaboration among partner organizations in support of the community’s effort to reduce and prevent substance abuse among youth. Providing information and educational presentations. Enhancing skills of our Coalition Members and those in the community who work with youth. Providing support for activities that build youth assets and protective factors or reduce risks to our kids. Changing the consequences that youth face for drug or alcohol infractions at school or in the community. Change policies around alcohol or drug availability in our community. Formed in 1984 as the Substance Abuse Task Force, this body soon became the Substance Abuse Prevention Council. The SAPC is made up of people from our communities who share a common concern about substance abuse and an interest and commitment toward its prevention. An excellent forum for parents, students, educators, clergy, and people from the business community, law enforcement, and local government also participate. In January 2013, membership voted to change their name to Substance Abuse Prevention Coalition to more accurately reflect their level of community collaboration. The SAPC is funded through the CT Department of Mental Health and Addiction Services’ (DMHAS) Local Prevention Council (LPC) grant program. As of September 30, 2016 the SAPC was awarded a Drug Free Communities support grant through the federal Substance Abuse and Mental Health Services Administration (SAMHSA). The Coalition has also received funding as part of Connecticut’s Strategic Prevention Framework, State Incentive Grant (SPF SIG) along with Youth and Family Services of Haddam-Killingworth and East Haddam Youth and Family Services as well as from ONDCP’s Drug Free Communities Support Program. Tri-Town Substance Abuse Prevention Coalition 12 Sectors Represented: youth, parents, businesses, media, school, youth-serving organizations, law enforcement, religious/fraternal organizations, civic or volunteer groups, healthcare, government and others involved in substance abuse. Hear parent concerns, plan educational events and town hall meetings. Build calendar of classroom lessons, special assemblies and school events centered on positive climate, youth leadership, drug & alcohol awareness, self-confidence and resistance skills. Provide youth perspective on issues, share concerns and develop new initiatives. Promote & support stress management, self-care and overall good health. Use state, local laws and ordinances & school policies to reduce substance use. Build more comprehensive safety net for higher risk youth (those using substances, in juv. justice or truant). The SAPC welcomes all who may be interested. Call our office at 860-526-3600 for the next meeting date. Prevention science today looks beyond singular problem behaviors at the broader scope of factors that promote or undermine healthy human development. Successful prevention programs consider the greater social and environmental factors that influence a young person’s ability to make informed, healthy decisions that support their physical and psychological safety. Click on any of the substance tab titles below to expand for more information. 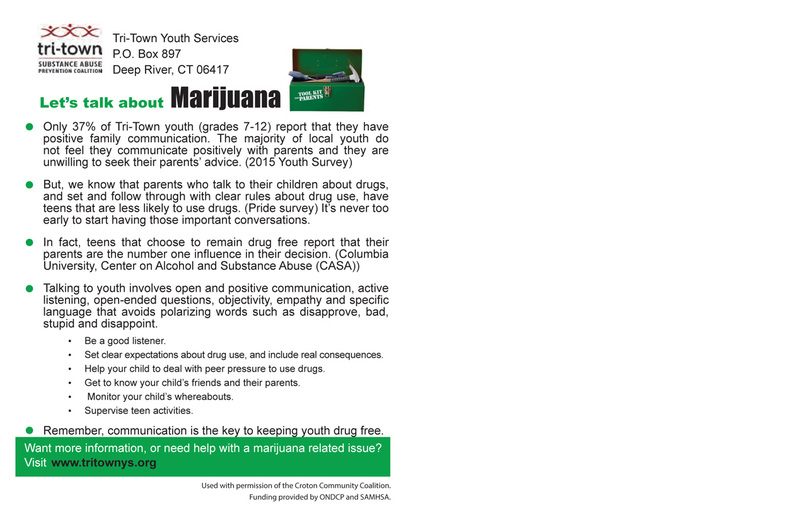 Kids often receive mixed messages about drugs and alcohol from the media, their peers, and even their parents. It’s critical to speak to your children in an informed way about alcohol and substance abuse from an early age. Parents have the power to better equip their children with the tools needed to handle the pressures and influences to use drugs. Alcohol and other drugs are powerful substances with the potential to cause harm to the mind and body. Learn more about how you can protect your child from drug use and abuse, and the importance of teaching your child to resist drugs and alcohol. 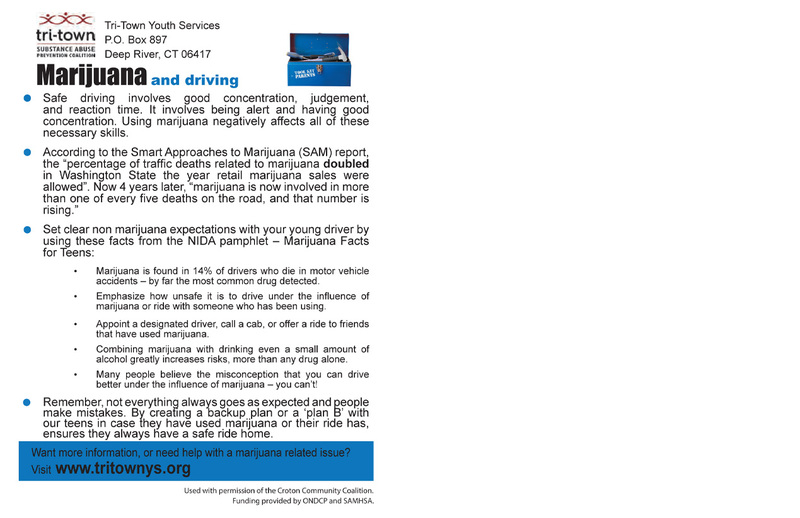 Above the Influence – Created for the National Youth Anti-Drug Media Campaign (out of the Office of National Drug Control Policy), this youth designed campaign shares facts and resources on how teens can aware of and rise above the influences around them. 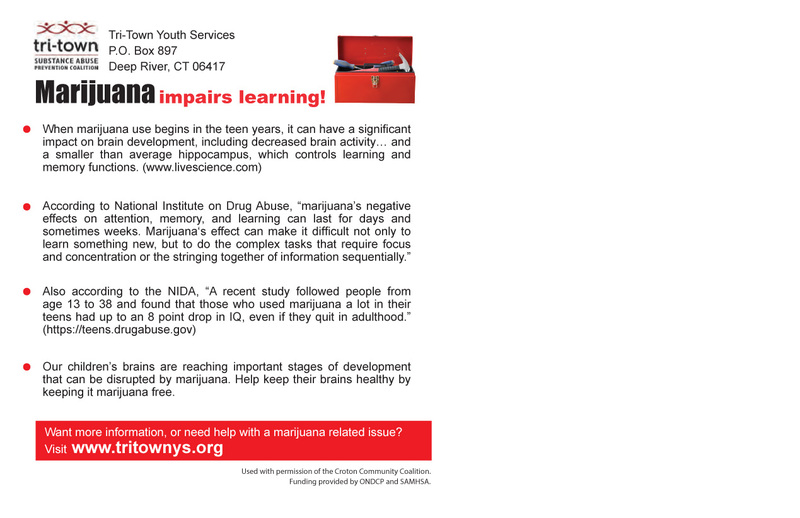 National Institute on Drug Abuse for Teens – A website specifically designed for teens looking for answers on the science behind drug abuse. There’s downloadable art, media, a blog, and honest answers to any questions a teen may have. Parents and teachers can also find tools on how to help their kids understand the science. But What About the Children? 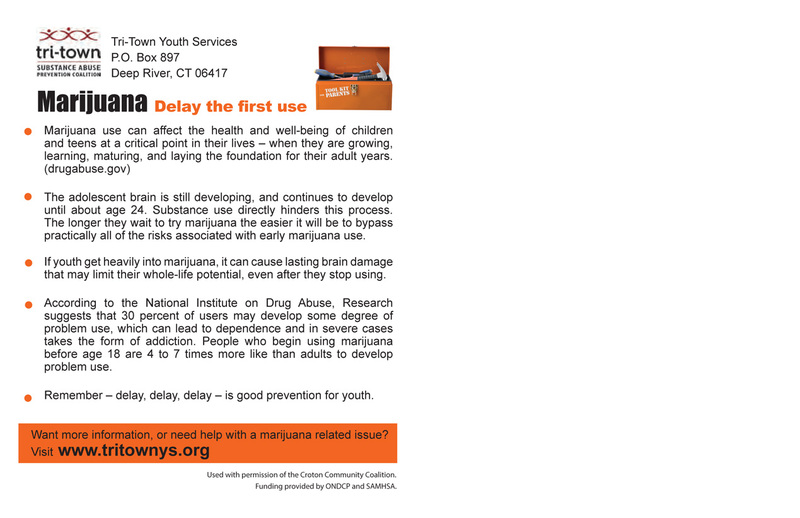 Campaign -A campaign from the organization National Families in Action (NIFA), the website provides resources for citizens to demand that if states have marijuana legislation, there are provisions to protect children. Find news and resources on medical studies and what states across the country are doing to protect children. Just Think Twice – Created by the Drug Enforcement Agency (DEA) for teens, this website details the facts and consequences of drug use and gives teens an opportunity to ask questions and learn more about the DEA’s role. The Search Institute Survey of John Winthrop and Valley students conducted in January 2017 revealed that only 46% of youth have clear rules and consequences at home, and parents who monitor their whereabouts. SAPC has targeted “parental permissiveness” as one of the root causes of underage drinking and drug use in our three towns. In the year ahead, SAPC will be conducting community surveys to learn more about local parents’ beliefs and behaviors, and identifying a comprehensive assortment of evidence-based prevention strategies to address parental permissiveness. Founded as Students Against Driving Drunk in 1981 in Wayland, Massachusetts, SADD has grown to become the nation’s leading peer-to-peer youth education and prevention organization with thousands of chapters in middle schools, high schools, and colleges. SADD continues to endorse a firm “No Use” message related to use of alcohol and other drugs, and highlights prevention of all destructive behaviors and attitudes that are harmful to young people, including traffic safety, substance abuse, and an array of issues dealing with personal health and safety. For Free Help or Information to Quit call the CT Quitline at 1-800-784-8669 or For the hearing impaired -TTY number is 1-877-777-6534 or go to www.CommitToQuitCT.com to enroll online. Meetings are by appointment, call 860-358-5420. Alcohol is the most commonly used substance by teens in our community. The SEARCH survey taken in January 2017 showed that 38% of high school students report having used alcohol once or more in the past 30 days, and 20% of high school students surveyed think it is not risky to have five or more drinks once or twice a week. SetTheRulesCT is designed to provide parents and adults with information and resources to help parents keep Connecticut’s youth from drinking alcohol. In our community, 5% of teens reported using pills not prescribed to them, once or more in the past 30 days. (SEARCH survey 2017). Rushford offers addiction recovery programs for adolescents. Visit https://rushford.org/ for more information. Visit Stop Medicine Abuse, a website resource created to provide information and stop over-the-counter (OTC) cough medicine abuse. TALK to your teen about OTC cough medicine abuse. 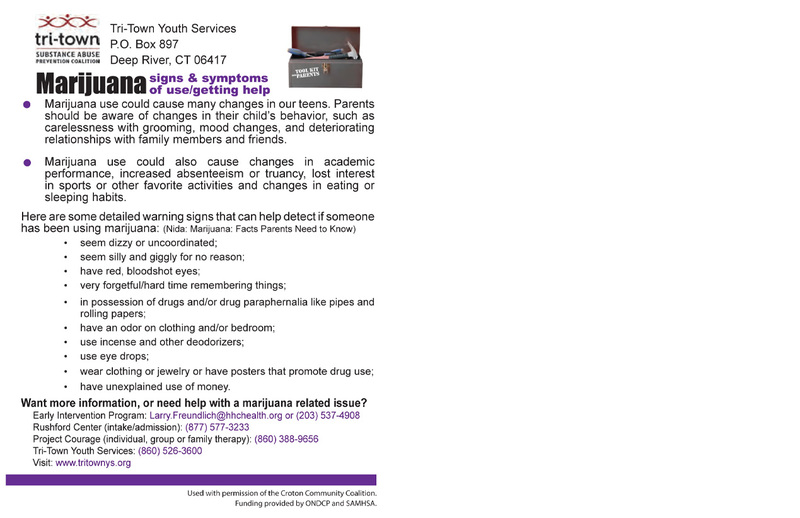 MONITOR your medicine cabinets and your teen’s activities. SHARE what you have learned with other parents and community leaders. 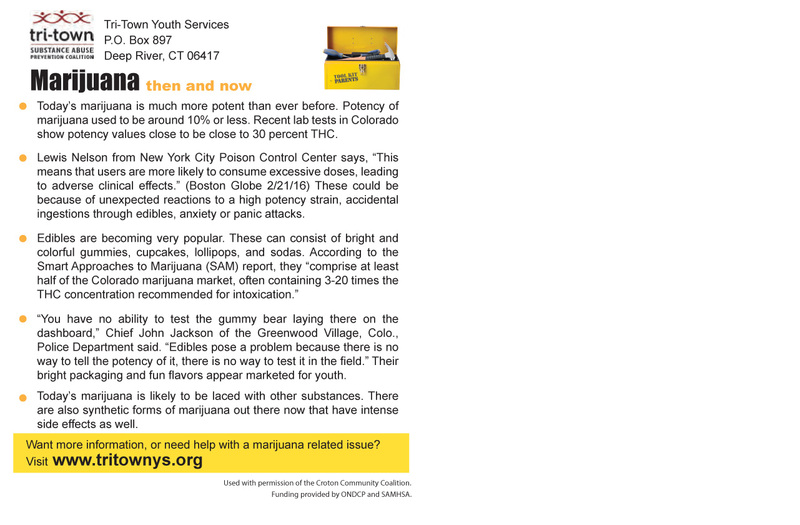 TTYSB mailed out these following postcards in Spring 2017 to increase adults’ awareness of marijuana’s effects on youth. Please click on the postcard images below to see the backside of each! Click on any of the prevention tab titles below to expand for more information. The Social Development Programs at Chester, Deep River and Essex Elementary Schools are a shining example of a comprehensive introduction to school-based prevention work. Increasing protective factors through leadership, community service and consistent messaging about social-emotional life are key ingredients to prevention for young people. TTYSB maintains communication with all three elementary social workers and is pleased to offer support or participate in the Social Development Programs. The Centers for Disease Control and Prevention report that suicide is the second leading cause of death among American youth ages 15-19. Equally concerning are the related depressive and suicidal thoughts, plans and suicide attempts made by youth each year. The 2015 High School Youth Risk Behavior Survey shows that 13% of Connecticut youth are seriously considering suicide in a given year. January 2017’s Search Institute Survey of middle and high school students revealed that 41% of the students who identified the lowest number of developmental assets (10 assets, or less) also reported that they skipped school once of more in the previous month. Our local data is consistent with research that shows the more developmental assets a young person has, the more consistently they will attend school and the better their academic performance will be. Gilead provides a broad range of high quality health care and recovery support services in the home and community to improve mental health, physical well-being, independence, and community integration for the individuals. For more information visit http://gileadcs.org/. Gambling free 24-hour toll-free helpline provides assistance to callers with gambling problems themselves, or someone they care about. Callers will be referred to the types of assistance that best suits their needs. Call 1-888-789-7777, or visit http://www.ncpgambling.org/help-treatment/chat/ for their live chat option.